Internet data usage includes all data used that you send and receive on your Citizens Residential Internet (CitiZip) services. This applies to both wired and Wi-Fi. This document contains information to learn how to manage, monitor, and estimate future data usage. Why does Citizens measure data usage for Internet customers? Given the rapidly increasing volume of data-rich Internet traffic, this program is designed to help keep Internet service affordable for our broad base of customers. Usage includes all the data you use; download & upload. When you access the Internet through your home network, wired or WiFi, using any device (including smartphones, tablets, or other devices that access the Internet), it will reflect your data usage. This includes software updates, email notifications, syncing photos, videos and files to the cloud, and social media posts. Individual usage results may vary based on the applications you use and the content you access. For example, if your emails have large attachments, the usage for that application may exceed what we have estimated in the data calculator. A gigabyte measures the amount of data you send and receive over the network. This is NOT the amount of time spent connecting to the Internet. A gigabyte (GB) is 1,073,741,824 bytes, 1,048,576 kilobytes, or 1024 megabytes. How much is 1 GB? An example to measure 1GB would be approximately 50,000 single-page emails without attachments. Watching an 80-minute movie in standard definition or about 20 minutes of a TV show or movie in high-definition each equals about 1GB. Quickly and conveniently check your usage by accessing your Citizens’ E-Care Account. If you have not registered for E-Care, be sure to have your monthly invoice in hand and click on the same or contact our office at 540.745.2111 or 276.637.6485. When you look at your usage, you will see an amount for Download, Upload, and Total Usage. Upon your request, Citizens has the capability review usage in greater detail. How can I determine the amount of data that I need? Citizens has an easy to use Data Calculator for you to use to estimate your future data usage. This Data Calculator lets you estimate the hours per day that you/your household browses the web, streams programs, conducts online gaming, and more. 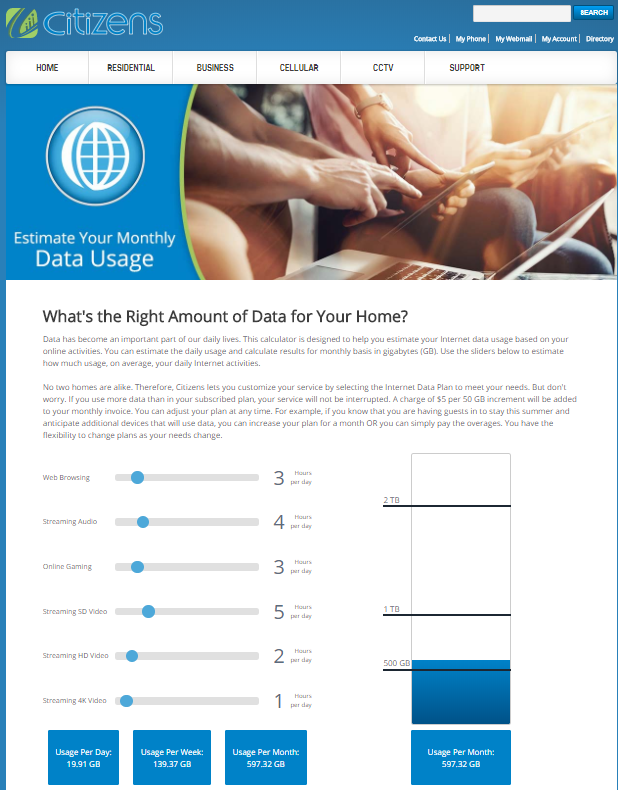 The sliding scale guide estimates the amount of data you will need for a month. What are the data allowances? Citizens does not limit, throttle, or interrupt your Internet service based on consumption. Discount Bundles available to include Internet for the home, telephone, and Citizens Digital TV. An overage charge of $5 per 50GB increments will be added to your monthly invoice should you exceed your data subscribed plan. For example: If you are on the 50GB plan and your usage is 123GB one month then you would be billed $10 in overages ($5 multiplied by 2). What is my current Internet speed? Will spending a lot of time on the Internet make me go over my data allowance? The types of activities performed matter more than the time spent online. For example, so-called data-rich activities, such as streaming video, uploading pictures or videos, gaming may use more data than sending text emails. Citizens does not limit, throttle, or interrupt your Internet service based on consumption. Therefore, you truly do not have an ‘allowance’. You are guaranteed access to a 1GB Internet connection. Your monthly Data Plan cost is based on the consumption of data tier to which you are subscribed. Should you exceed your subscribed Data Plan, we will simply add a charge of $5 per 50GB increments to your monthly invoice. Based on your needs, you can increase your plan at any time by calling our office. CitiZip Fiber customers have the ability to view Internet Usage (download & upload) online through your Citizens E-Care account. If you are not signed up for Citizens’ E-Care, please contact our office. Help me understand more about what I can do with my Data Consumption each month. First, find your data (usage) consumption in the table below, then read down the column for details about how that number translates into monthly activities. Does using WiFi count as usage? If you access your residential Internet over your WiFi home network using any type of device (including smartphones, tablets, and some home automation equipment), that counts as Internet data usage. However, if you access the Internet via a public or commercial WiFi hotspot, that type of access does not count as usage on your home service. Can anyone who doesn’t live in my home affect my bandwidth usage? Citizens’ WiFi gateways are secured, however, anyone that you have shared your WiFi password with can use your service and therefore they can affect your bandwidth usage. If you are using another gateway or router and have not secured it, someone nearby with a computer or other WiFi-enabled device could access your home network, use your high-speed Internet, and increase your data usage. Common encryption protocols, such as Wireless Encryption Protocol (WEP) or WiFi Protected Access (WPA), can provide additional security. Citizens recommends securing your WiFi with a password. Access can only be gained if you give the person the password. Citizens’ WiFi is supported 24/7 by calling 1.800.741.9525. When using a personally purchased router, check the manufacturer's support website for help in securing their Wi-Fi gateway. Will using wireless TV receivers count against my monthly data usage? Access for Citizens Digital TV on Citizens CitiZip Fiber will not affect your monthly usage. Utilizing our WatchTVEverywhere service if used at home would count as data usage. Viewing standard video content through a satellite provided TV receiver connecting to your Wi-Fi gateway may count as data usage. Pay-per-view video, On-demand content, software updates, and DVR schedule data may use your internet connection and therefore could count as data usage. Will using Wireless/Cellular and other applications count toward my data usage? Yes, if you access TV, mobile, tablet, and wearable applications using WiFi in your home, this will generate usage. Cellular devices prefer a WiFi connection and therefore will attempt to connect to WiFi and use it versus the cellular network. In 2017, an estimated 60% of mobile data traffic was offloaded to WiFi in the home. If I stream on my devices over my home WiFi, will this count toward my data usage? If you stream on your computer, laptop, tablet, or mobile device, over your home internet service WiFi connection, usage will count towards your home Internet monthly data usage. How often does Citizens update usage data? Usage data is pulled from the network multiple times per day. You can monitor your usage through your Citizens E-Care account at https://citizens.coop/myaccount/. What is my Data Usage Cycle? Data Usage Cycle runs the 21st through the 20th of each month. Data Usage is billed like long distance charges; data used the previous month; based on your billing cycle. Data used on the first day of a new bill cycle may be delayed for viewing on E-Care due to cycle cut-off and start of a new bill cycle. How do I know if I went over, or if I’m about to go over? Email notifications will be sent to the primary contact email address given when you registered for service. You will receive email notices when you have used 50%, 75%, 90%, and 100% of your data consumption. Citizens is establishing Text notifications. Enroll for text notifications by contacting a Citizens Sales Consultant with the number you wish to receive the text message. Standard messaging rates may apply. Important Note: Your Internet service will NOT be interrupted should you exceed your data usage. A charge of $5 per 50GB used will be added to your monthly invoice. How do you know that your usage measurement is accurate? A dedicated team of highly trained and specialized billing agents thoroughly pull data, match with equipment identifiers per account holder, and review for accuracy on a consistent basis. Usage detail available upon request. Is my 1Gbps Residential Fiber Service Symmetrical? No, CitiZip Fiber is a 1Gbps download/500 Mbps upload connection. How do I conduct a Speed Test? Wire Speed and WiFi Speeds are not the same. A 1Gbps speed test will not accurately run while connected via WiFi. Most older computers will not accurately speed test a 1Gbps connection even if it is the only device connected due to slower hardware. Having other devices connected to your network even if they are not actively being used can impact all speed test results. Use Citizens Speed Test. Using a speed test pointed to Citizens' speed test server, the speed test will NOT count against customer's data usage. Speed tests from other websites WILL count toward customer's data usage. At the time of install, our Techs perform speed tests which are not counted toward the customer's data use. 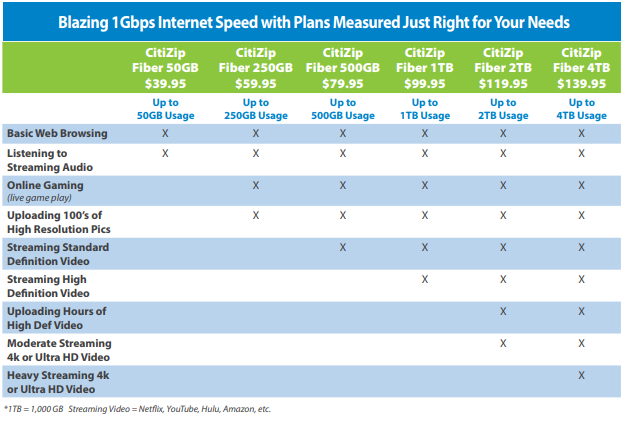 Why is Citizens implementing Data Usage Plans instead of traditional speed packages? Data is the future for residential services. The newest technology offered by Citizens enables an ‘open pipe’ for our customers to use data as needed instead of limiting use of data based on speed. All customers will have a 1Gbps connection to use as needed. The gives a better customer experience when using our service, eliminates ‘slow speeds’ troubles due to maxing out your upload or download bandwidth.